I'm on a Reacher kick. My 5th in a row, Echo Burning gets back to the formula we know. Reacher meets someone in trouble and helps out. Here he's in Texas, trying to avoid the cops after he knocked out an off-duty cop. A woman picks him up and he's taken to her house, a compound in the middle of S Texas. She wants him to kill her husband, who she says abuses her. Reacher wants her to leave, but she won't. He gets hired on as a ranch hand, and as we might expect, the other hands can't chase him off. The brother doesn't intimidate him, and he's unsure of what's going on. As he tries to work through the situation, we also see there are three killers on the loose in the area. 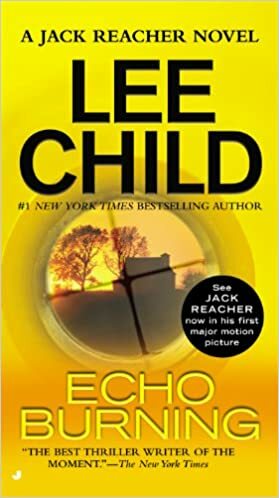 When the woman kills her husband and is arrested, Reacher is thrown off the property, but he continues to investigate. I couldn't remember what happened, and enjoyed the story as it unfolded. Not a great one, but enjoyable.